Plot: This is the third book in the paranormal thriller series The Unearthed by Evan Ronan. Anson Ketcher is being charged with the murder of his wife Alice. Not only is Anson’s violent past, his drinking problem, and the issues in his marriage hindering his innocence, but he claims he didn’t do it and that a ghost killed his wife. Anson’s only ally is Giles Tyson, a paranormal investigator who had just been exposed for fraud, and a former member of Tim and Eddie McCloskey’s team.Now Giles has called upon Eddie McCloskey to help prove Anson’s innocence and to find the real killer. I have come to the conclusion that I am undoubtedly ADDICTED to this series, and that I can no longer live without it. If there were no other books in this series (thank Evan Ronan that there are! ), I would dig myself a hole and live in it while crying like a deranged addict who can’t get their next fix. The Accused and the Damned is about a woman named Alice Ketcher who turns up dead in her home with a broken neck, and her husband Anson claims a ghost is the culprit. Eddie McCloskey is now the expert witness in Anson’s defense, as a favor to his old friend Giles Tyson. After Alice and Anson start experiencing strange paranormal incidents in their home, they enlist the help of Giles Tyson to get rid of the ghost. As Alice starts to notice that the presence of Giles is making the ghost appear more, she starts to visit a psychic that teaches her about reverse possession in the hopes that it will help get rid of the spirit. The story takes the reader through the investigation of the murder and the trial of Anson Ketcher, while Eddie works to find out who the real murderer is or if a ghost actually did it. Usually, by the third or fourth book in a series I start to get a little bored with the same characters and the predictable direction that the series is going. If I said that this was how this series has played out, I would be telling you a terrible lie that would only hinder the satisfaction you would experience from reading these books…and I just COULDN’T do that to you guys. 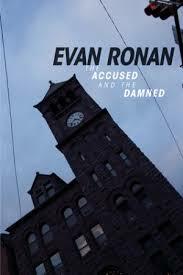 I LOVE this series, and this book The Accused and the Damned is my favorite thus far. Not only is the title KILLER, but the book is dripping in mysterious paranormal experiences and crazy murderous character twists. Evan Ronan’s style of writing has improved SO MUCH through this series. As I had said in my reviews of the previous books in this series, he was using a strange writing style way too much in the first book and there was a lot of grammatical errors in the second. I found maybe one or two grammar mistakes in this book, and the author has really sculpted his “Instant Messaging” dialogue style of writing so that it flows smoothly with the story and isn’t overused to a point that it confuses the reader. While reading this book I was taking notes for my review (key characters, descriptions, clues, etc.) and I found myself taking side notes about who I thought had done it. I will say I had a hunch since the start of the book of who had done it, and I was right, but there were so many other things that twisted the story that it made me second guess MY GUESS. I also found myself writing done hilarious quotes in the book, as well as some very unique ones (see opening quote above). Not only is the authors writing style improving and making the read more enjoyable, but his character development is way more in depth. I am obviously attached and invested in Eddie’s character, but I felt like I knew the characters in this book much more than the characters in the past two books. I do wish the author would have elaborated more on the couple that occupied the house before the Ketcher’s though, you can never have too much background info and history in a story. So READERS, if you haven’t purchased this series yet then I don’t know what you’re thinking, but you’re not thinking clearly! This is an AMAZING series and it is only getting better as the books go on!